Le Chemin des Rognes is a challenging mountainous route that begins in Bellevue and ends in Baraque des Rognes and takes three to four hours. Although it’s difficult, this hike offers wonderful views of the Chamonix Valley, the Aiguille du Midi, and the Aravis Mountain Range. In the Chamonix Valley, the Glacier de Argentière route is a 2.5-hour hike on a steep incline, ascending 90 meters with breathtaking panoramas at the top. Accessible from the Grands-Montets à Argentière cablecar, the hike begins in Lognan. In the Chamonix-les-Houches and Saint-Gervais Mont-Blanc valleys, La Charme is a short 40-minute hike on a wide, rolling path accessible from the Mont Blanc Tramway at Le Fayet or Saint Gervais. Along the way, hikers will pass by a farm where they may buy goat cheese and will also come across the modern Le Prarion Hotel and Restaurant overlooking the gorgeous scenery. The hike ends at the Chalet de la Charme, a traditional alpine guest house with five comfortable rooms. In the Valle d’Aosta, the Maison Vieille Refuge route is a two-hour hike accessible from the Courmayeur funicular. This relatively easy hike ends at the Maison Vieille, a rustic mountain lodge in a sunny valley. 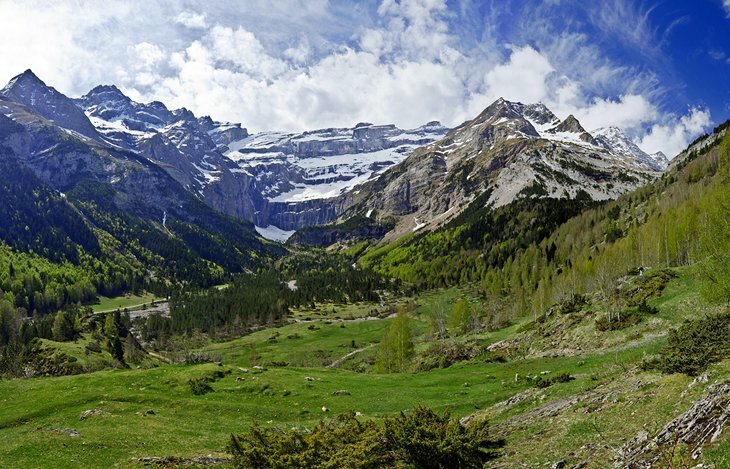 In the lush National Park of the Pyrenees Mountains, the Cirque de Gavarnie is a UNESCO-listed World Heritage Site that’s accessible to most visitors. An easy loop walk begins in the historic village of Gavarnie, past the Hôtel du Cirque and horse stables, and then follows the stream up to the head of the valley. With almost no incline, this trail lends itself to more of a stroll than a hike. The breathtaking scenery, with sheer 3,000-meter-high glacier-formed granite rock walls enclosing the valley, gives the impression of being a cathedral in nature.